How Do You Solve a Problem Like Cavani? As the leading goal scorer in Serie A, Edinson Cavani is a force to be reckoned with. In 26 league games played, he has 20 goals, an average of .8 goals per game. Which means if you are the opposing coach, there’s an 80% chance he’ll score against your team. Unless you can stop him. The Uruguayan phenomenon on loan from Palermo generally plays up front in Coach Walter Mazzari’s most common 3-4-2-1 formation. His headers are lethal, few can defend them. He doesn’t just score goals, but like a tiger, waits patiently for an opportunity, then moves stealthily and quickly to pounce on it. His quick movement and football intelligence allow him to always be at the right place in the right time. Which is a nearly impossible feat for the opposing keeper to replicate. 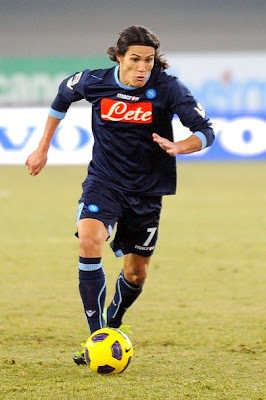 Cavani has had many amazing performances this year, including many spectacular goals. One such performance was vs. Juve in January, where El Matador scored a hat trick. Not just any hat trick, either. He headed the first two in, and his third goal was an impressive “scorpion kick goal,” so amazing, it almost went unnoticed. So…how DO you solve a problem like Cavani? Well, his buddy Lavezzi may have given us a big advantage. Lavezzi has partnered up with Cavani this year to feed him numerous assists. However, Lavezzi was recently suspended for spitting and will miss Milan’s match on Monday. He was sorely missed in Napoli’s game against Catania on Sunday, where Napoli eeked out a 1-0 win in a game which saw Cavani miss a penalty kick and the team as a whole play in very poor form. But Lavezzi’s suspension in no way leaves the tireless Cavani stranded up front. Napoli are a team who are very deep when it comes to quality and possibly deeper when it comes to determination. Cavani isn’t a striker who is the most creative at making opportunities, but if you give him even the slightest chance, he will definitely take advantage of it. With 2 men behind Cavani and a 4 man midfield, they are built to support his attacks and to attack from any angle. It will be very important for Allegri to field a team that are capable of maintaining possession against this formation. When Milan are able to play their possession game, they typically win, so let’s hope they can dominate in the midfield and keep Cavani neutralized. Obviously, Nesta & Silva will need to bring their A game at the back. Their combined abilities to read the plays and their strength and speed will be vital. They will need to stay one step ahead of Cavani at all times, even when marking others. But they will also need to step up their aerial game to compete with Cavani’s headers. And if their teammates can do their part to prevent aerial crosses in the box, then we stand a fighting chance of keeping Cavani scoreless. We will need the right balance of defensive and attacking midfielders to interrupt Cavani’s feeds and also to keep possession and create plenty of chances for our own strike force. Given Cavani’s pace and the explosive attack of Napoli in general, I would venture to say that Allegri needs to trust some of his younger, faster players in the midfield and limit the number of “experienced” (translate: Seedorf) players for this matchup. Above all else, Milan need to anticipate the passing and crosses and stay one step ahead of Napoli’s El Matador. Playing our possession game and scoring early on will be crucial as usual, but if we are able to cut off his supply line and anticipate him before he arrives, we can solve the problem of Cavani. But will we be able to do that while shutting down his 10 very capable teammates, too?